Austrian writer; born at Vienna 1811; educated at the Schottengymnasium and the University of Vienna (M. D. 1835). He published in 1828 in the "Sammler" a poem on Ludwig Devrient, and wrote in 1831 a drama on the marriage of the Austrian crown prince Ferdinand, which was produced several times on the Vienna stage. In the same year, using the nom de plume "Sigmund," he became a collaborator on the "Theater Zeitung." In 1833 he traveled through Moravia, and in 1835 published in Leipsic his "Mährische Reisebriefe." He went to Dalmatia in 1837 as physician and served as surgeon in the honved army during the years 1848 and 1849. His subsequent history can not be traced. Other works by Schlesinger are: "Eleonore von Toledo," Vienna, 1833; "Herbst-Novellen," ib. 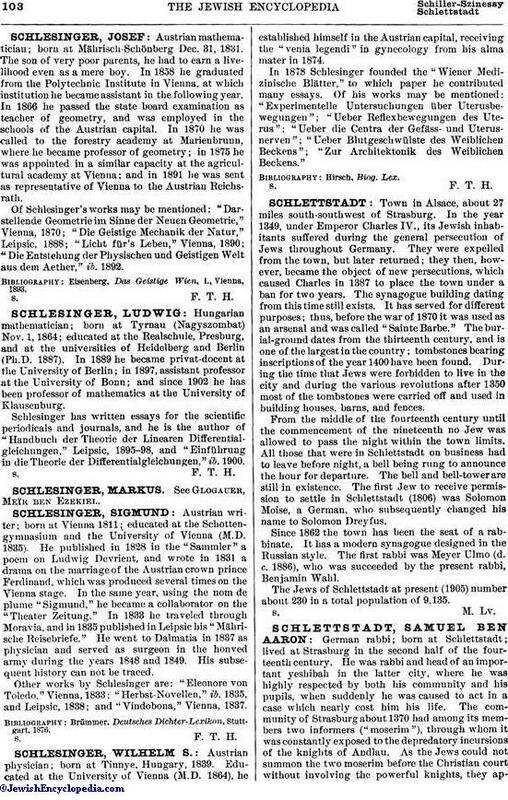 1835, and Leipsic, 1838; and "Vindobona," Vienna, 1837. Brümmer, Deutsches Dichter-Lexikon, Stuttgart, 1876.